Origen de la yllustrisima casa de Morales y las agregadas a ellas. A Andrés Maldonado de Morales vezino de Mexico. Escríbelo y dedícalo el capitán Antonio Fernández Lechuga. Mexico, 6 July 1688. Manuscript 24 leaves written on both sides. Great Folio Original parchment, creased, some staining, with ties. Some restoration to the upper margin throughout. Some dampstaining and browning. Large handwriting. 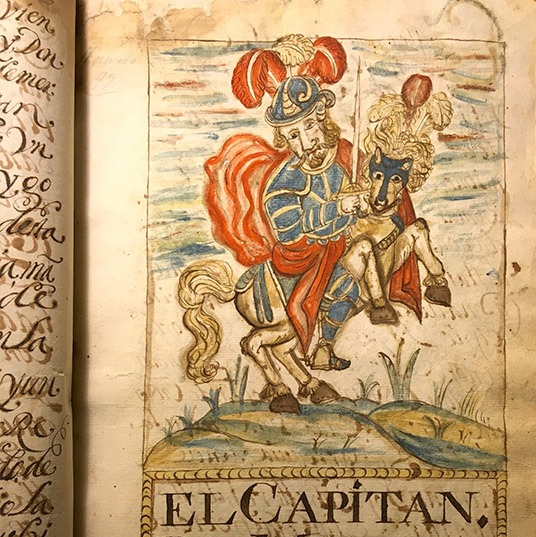 Four headings in colour representing mythological figures and three full page portraits, all of them in a powerful naïve Mexican style. Twenty six coats of arms of different branches of the family and in different sizes. Although Fernández Lechuga must have written other genealogies, this is apparently the first to have reached the market.